We offer two choices of frame thickness for your canvas print: 0.8 in (2 cm) / 1.6 in (4 cm). As part of our special offers, we regularly offer popular sizes at reduced prices. Go to cheap canvas prints. We offer canvasses in extra large sizes. Larger canvasses are available up to 100 in (2.5 metres). Go to big canvas prints. On request, we can produce custom canvas sizesof up to 120 in (3 metres). Calculate your custom size here. Want to send your canvas print with express or next day delivery? Find out more about delivery prices and times. The photo on canvas is the most successful amongst wall pictures. It is particularly attractive because of its three-dimensional effect and even has its own integrated frame. The fact that the wide range of available photo canvas print sizes meets the needs of every customer also contributes to its success. The canvas photos are handmade. It’s hard to believe these days but every canvas printed in every size is put together by hand. This allows, for example, the simple, modular construction of the product, which is composed of the canvas print itself and a wooden stretcher frame. These frames are put together in various sizes using stretcher bars. This way, we can offer a vast range of sizes. When is a photo on canvas “large”? Deciding on a particular size isn’t always easy. If you don’t have any experience with canvas photo prints, it can be tricky to gauge the dimensions correctly. It may help here to know that most canvasses are ordered in the sizes 60 x 40 cm to 90 x 60 cm. Around 60% of all orders fall under this segment. Small canvasses such as 40 x 30 cm or 20 x 20 cm make up another 20% or so of orders. Print canvasses over 90 x 60 cm to 120 x 90 cm make up approx. 15% of orders. The other 5 % are photo canvasses in XXL format. These can be up to 240 x 120 cm in size. 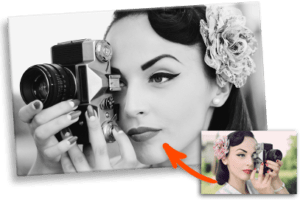 Photo canvas in the classic photo format – The canvas photo print in the classic photo format has the aspect ratio of 3 to 2. This aspect ratio comes closest to the “golden ratio” and has a particularly elegant effect. Even the good old print photo had this format. We see this ratio in the sizes 9 x 13 cm or 10 x 15 cm. Canvas print sizes which correspond to this format: 30 x 20 cm, 45 x 30 cm, 60 x 40 cm, 75 x 50 cm, 90 x 60 cm, etc. 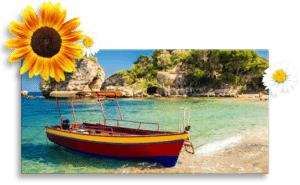 Photo on canvas in the digital photo format – Canvasses with the aspect ratio 4 to 3 are said to be in digital photo format. For a long time, this format was the standard size of image in digital cameras. It corresponded to the monitor standard of the time when digital cameras became popular. Photo canvas sizes in the 4 to 3 ratio are: 40 x 30 cm, 60 x 45 cm, 80 x 60 cm, 100 x 75 cm, 120 x 90 cm, etc. 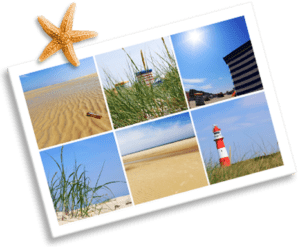 Square photo canvas print – sizes The square photo print is naturally a very popular format. Both the 20 x 20 cm square format canvas and the 40 x 40 cm canvas are among the ten best-selling canvasses overall. 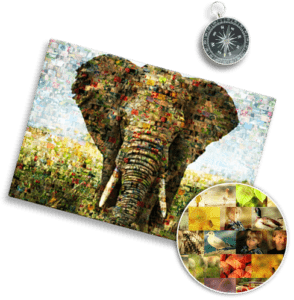 The reason may also lie in the fact that the square canvas format lends itself wonderfully to a split canvas print arrangement. These sizes are especially popular amongst square canvasses: 20 x 20 cm, 40 x 40 cm, 50 x 50 cm, 60 x 60 cm, 80 x 80 cm. 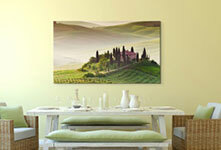 Panoramic canvas prints sizes – The panorama is the least popular of all the formats introduced here. 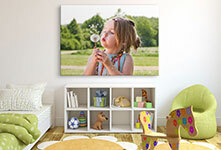 Only 4% of customers choose horizontal canvas print sizes, which we offer in the aspect ratios of 2:1 and 3:1. The most popular panoramic canvas sizes are: 40 x 20 cm, 80 x 40 cm, 100 x 50cm, 120 x 40 cm and 120 x 60 cm. Each canvas format is available in many different sizes. Depending on the file the application will recommend several different sizes and formats. If you are unsure which product is best suited to you, we also offer a trial use. Here you can print out a cheap canvas print and check whether the print itself meets all your expectations.